Rendered with head in profile and the body in a two-thirds frontal posture, this hollow-cut silhouette by the Puffy Sleeve Artist is distinguished by its primitiveness as well as the abstract perspective as are the other works by this unknown artist. While there is no biographical data concerning the Puffy Sleeve Artist his works have been found in Vermont, New Hampshire and Massachusetts and all are dated to the 1830-1831 time period. 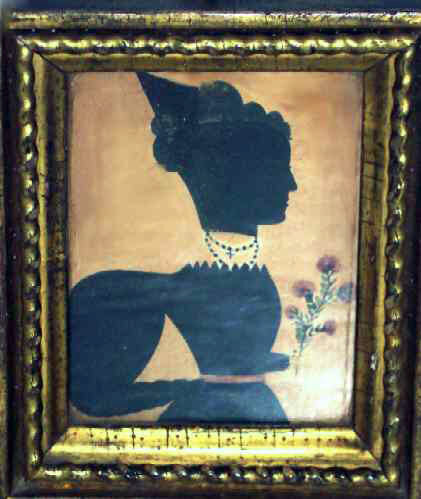 In all cases the head of the sitter has been cut out and laid over a piece of black paper or fabric, and the body is painted in watercolor. The women face right (the men face left) and wear a dress with an unusually large "puffy sleeve". Their right hand rests at waist level, while the left hand holds a decorative object such as a purse, flower, book or parasol. They all have combs in their hair that have been cut into the hollow work and their heads sit high above thir bodies, giving ample room to display their necklaces or fichus (collar). In this case our lady wears a crucifix around her neck and holds a sprig of flowers. There is a ribbon around her waist as found in all other examples. It is framed in the original frame with an inset rope motif as are most others. It still retains it's original bubbly glass. Fine original condition with some toning to the background paper and some discoloration. It is interesting to note that the identity of the artist whose work is so distinctive can be so elusive. The work of the "Puffy Sleeve" Artist is highly sought after by collectors and is appreciated for the wonderful Folk Art that it is. Once you have seen one example, you will surely recognize any others you may come across as the artist painted true to his pattern with no deviations. Charming and Naive`, it is Folk Art at it's best and every serious collection of Silhouettes should have at least one example. Size is 5" x 4"